Thin, low weight and large tiles, made mostly of ceramics with little flexural resistance require special care when fixing to obtain best results and avoid deformations. • Thin tiles are available in various sizes: from 30 x 30 cm to 100 x 300 cm. The solutions are given in this case apply for tiles sizes up to 60 x 60 cm (maximum size of tile included in standards for tile adhesives). For tiles sizes above that, please consult our technical department. 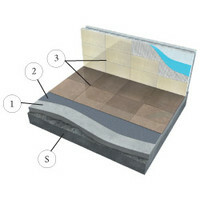 • Thin tiles generally have a thickness between 3 and 5 mm, and a low porosity. • If the thin tile is supplied with a mesh on the back, the mesh and mesh adhesive should not cover more than 25% of the back of the tile, otherwise it could affect the final adhesion. • Because of their low thickness, thin tiles are also more flexible than standard tiles. A deformable or flexible tile adhesive should be used. • Because of their large size and their high flexibility, it is highly recommended to use a fast-setting tile adhesive, to avoid bending/ warping issues that would let the edges of the tiles go up in arrow shape. 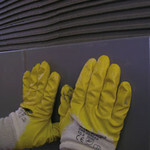 The use of a fast-setting tile adhesive will ensure that all the parts of the tile are well bonded with the substrate. • These thin tiles cannot be applied in high-traffic areas. Not all the thin tiles have the same shock resistance. Therefore, some of them cannot be applied on floors or over a heated floor. It is important to check the scope of use of the tiles given by the tile manufacturer before applying them. • Thin tiles need a very smooth and flat substrate (old tiles for instance). Due to their low thickness, it is not possible to correct the flatness defaults of the substrate. As well, to avoid that the tile adhesive goes out from the joints during application, it is recommended to use a tile adhesive with whose consistency is not too fluid. • The back-buttering method is mandatory to apply thin tiles: apply tile adhesive on both the substrate and the back of the tiles, to ensure full adhesion and avoid hollow spaces under the tiles. To obtain a smooth flat surface, make a screed with weberfloor easy 625 or weberfloor 535 FD, a premium self-leveling compound. Wait 3 days minimum before tiling. Check the flatness of the substrate: maximum tolerance is a 3mm difference under the 2 meters ruler. The substrate must be clean and sound. Use a 9 mm notched trowel for 60 x 60 cm tiles, using the back-buttering method. For bigger sizes, consult our technical department. If webercol fast or webercol F1 has been used for tiling, wait only 3 hours before grouting the tiles. With other tile adhesives, wait at least 24 hours before grouting the joints. The grouting will be ideally made with weberjoint perfect or weberepoxy easy. In order to compensate for the low quantity of joints applied when tiling large tiles, joints are prefered to have a width of at least 4mm.